What does the aftermath of last week's lynching of a 50-year-old Muslim man by a Hindu mob over rumours that his family had been consuming beef say about political imagination in India? Mohammad Akhlaq, an ironsmith, was killed in his village in Dadri in Uttar Pradesh, barely 50km (31 miles) from the Indian capital. His 22-year-old son Danish was seriously injured in the attack. Another son, Mohammad Sartaj, who works as a technician with the Indian Air Force, survived the attack because he does not live in the village. A week into the horrific incident in his backyard, Prime Minister Narendra Modi, usually so active on social media, has maintained a studied silence. He has expressed his "gratitude to American people" for their hospitality during his recent trip to the US, greeted a cabinet colleague and a governor on their birthdays and the people of China on its National Day, offered his condolences on the death of a singer's son and congratulated a billiards champion on his prolific twitter feed. Not a word on Mr Akhlaq. Mr Modi's soundlessness on Dadri, according to historian, Shiv Visvanathan, is the "silence of indifference which becomes obscene, because it denies dignity to the victim". His BJP party, which rules India with a whopping majority, has done worse. Tarun Vijay, a senior party MP, wrote in a newspaper that "lynching a person merely on suspicion is absolutely wrong, the antithesis of all that India stands for and all that Hinduism preaches", almost implying that lynching a person when you are sure that he has consumed beef could possibly be condoned. "Vijay has accomplished the astonishing feat of even making apology look almost homicidal," wrote outraged columnist Pratap Bhanu Mehta, adding that the "blame for this has to fall entirely on Modi". The poverty of political imagination did not end with Mr Modi's silence and Mr Vijay's article. Mahesh Sharma, federal culture minister and local MP, visited the dead man's family, and said that the "murder took place as a reaction to that incident", alluding to rumours of cow slaughter in the area. Mr Sharma reminded reporters that there was a teenage girl - Mr Akhlaq's daughter - in the home, and nobody had touched her, as if India's women should be eternally grateful for such small mercies. And, on Sunday, party lawmaker Sangeet Som, visited the victim's village and stoked religious tensions by saying Hindus were capable of giving a "befitting reply" if innocent members of the community were "framed" for the murder. The opposition parties have done no better. Rahul Gandhi, the heir-apparent of the enfeebled 129-year-old Congress party, visited Mr Akhlaq's family nearly a week after the incident. He put out half-a-dozen anodyne tweets, saying "touched by the desire of the villagers to maintain harmony" and that this "spirit will help the country through tough times". It was almost if this "politics of naiveté and adolescence", as Dr Visvanathan calls Mr Gandhi's politics, had abdicated from its responsibility of shoring up bipartisan secular support against the poison of communalism, and left it to the people to fend for themselves. This is all India's Grand Old Party could manage. Observers say the less said about the Samajwadi Party, the powerful regional party which rules Uttar Pradesh, the better. The state appears to have withered away under its rule; and incidents of religious clashes and crime are on the rise. The government, run by Akhilesh Yadav, appeared to buy peace on the cheap. Mr Yadav flew out Mr Akhlaq's family to the state capital, Lucknow, upped compensation for the family for the third time since the incident and assured them justice and security. The Aam Aadmi Party's Arvind Kejriwal's foray into the village, again nearly a week after the incident, accused the police of trying to stop him from entering the village and then, and attacked other parties for "indulging in vote bank politics". Been there, heard that. 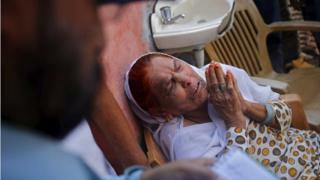 Indian air force chief Arup Raha was quick to react, saying that they were looking at a way of moving Mr Akhlaq's family to an air force neighbourhood. "We are with him, and our people are there to assist his family," he said about Mohammed Sartaj. And on a Sunday night talk show, a grief-stricken Sartaj invoked Sare Jahan se Acha, Hindustan hamara (Our India is the best country in the world), Iqbal's patriotic ode to India with a dignity which eludes most politicians in India. "Why should I blame the majority [of Hindus] for the faults of a few," he said. The fact that Mr Akhlaq's last call for help was to a Hindu friend before the mob descended on his house, and that a number of Hindu families in the village moved many of their Muslim neighbours to safety also offer hope. This proves that India's armed forces remain resolutely secular and most of its people - despite the fact that many in Mr Akhlaq's village showed no remorse after the incident - remain plural. "The reaction to Dadri indeed points to a larger failure of India's political imagination," says political psychologist Ashis Nandy. India's democracy - a gift which has kept the diverse country together - appears to be all about winning elections alone. "Every party sees every issue as a political opportunity. There is this obsession with electoral politics alone. Electoral democracy has actually become anti-democracy. Electoral politics has become obscene in India," says Vishvanathan. India, clearly, needs to fix its dysfunctional democracy. On the one hand it needs more democracy, but the idea of democracy cannot begin and end with elections alone. Until that happens, lives like Mohammad Akhlaq's will continue to be lost because of, say, the politics of food. Will India's parties please stand up?